The Government’s big-ticket item in the capital investment plan will not be delivered for at least 12 years. 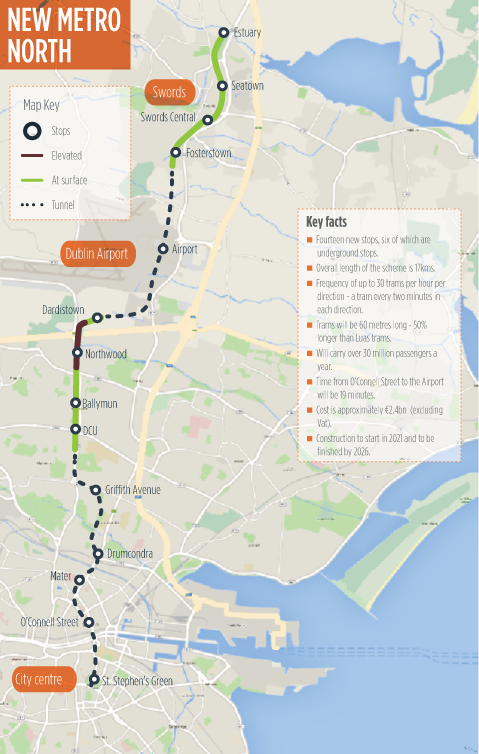 Construction works on a scaled-down Metro North project, set to cost €2.4bn, will not begin until at least 2021 – and the 16.5km line between Dublin City, the airport and Swords will not carry passengers until at least 2026 or 2027, Transport Minister Paschal Donohoe said. The new light rail system will have 14 new stops – six of which are underground – with an overall length of 17kms. It will also have up to 30 trams per hour in each direction, with a tram every two minutes. The trams will be 60 metres long – 50% longer than current Luas trams. The Metro North will carry more than 30 million passengers per year, with a trip from O’Connell Street to the airport set to take just 19 minutes. The coalition’s ‘Building on Recovery: Infrastructure and Capital Investment 2016-2021’ plan sets out €42bn worth of investment over the next six years, and promises to deliver 45,000 construction jobs. The exchequer will directly fund €27bn worth of projects, with another €500m funded through public-private partnerships. The remaining €14.5bn will come from State agencies including NAMA, Eirgrid, Bord na Mona and Irish Water. The centrepiece is a €10bn transport plan, of which a large bulk of the funding is allocated to ongoing maintenance designed to maintain the network ‘as is’. Design work on Metro North, which was chosen following a review by the National Transport Authority (NTA), will begin next year, with the NTA insisting that most of the €170m spent on an earlier version of the project would be recouped. The new version will be around €1bn cheaper to deliver because one stop has been removed, and less tunnelling is involved. Mr Donohoe defended the delay, saying it would deliver an “immense return” to the taxpayer, and provide a 19-minute journey time from the city centre to the airport. Some €860m is available for new road projects, as well as a schools programme to cater for more than 60,000 pupils. Some €275m is proposed for broadband – half of what was expected – and there is also funding for 80 primary care centres, new maternity hospitals, the new children’s hospital at St James’s and construction of the National Forensic Mental Health Services Campus in Portrane, which replaces the Central Mental Hospital in Dundrum. In addition, some €444m is set aside for energy efficiency projects, and €430m for flood defence schemes. A new IT system for An Garda Siochana, and fleet replacement, is also planned. State bodies will play a key role in the delivery of the plan, with some €5bn expected to be invested by Eirgrid, Bord na Mona and the ESB on energy – including the controversial pylon projects which have divided rural communities. Irish Water is expected to spend €4bn, and NAMA will spend €3bn on housing projects to deliver 4,500 units. Taoiseach Enda Kenny insisted the plan was affordable, and was not designed to ‘buy’ the General Election. “For those who say this is politically oriented, believe me, it’s in the interests of Ireland – and people will, in any event, make their judgment when they have their opportunity,” he said. Tánaiste Joan Burton said it would “build on the recovery”. However, the opposition said it was long on aspiration but short on detail, with Fianna Fail’s Sean Fleming noting that it relied on the private sector delivering €15bn of investment. “It is a wish-list of what many people would like to see happen in the country. That private investment is essential to this plan, but the Government has no control over that private investment,” he said. Sinn Féin’s Pearse Doherty described it as “very unambitious”, adding that by 2020 we would have the second-lowest capital spend per GDP in Europe. “It is truly amazing what the Government can get away with when its PR machine kicks into overdrive,” he said.